Growing sweet potatoes can be an important part of your food plan. 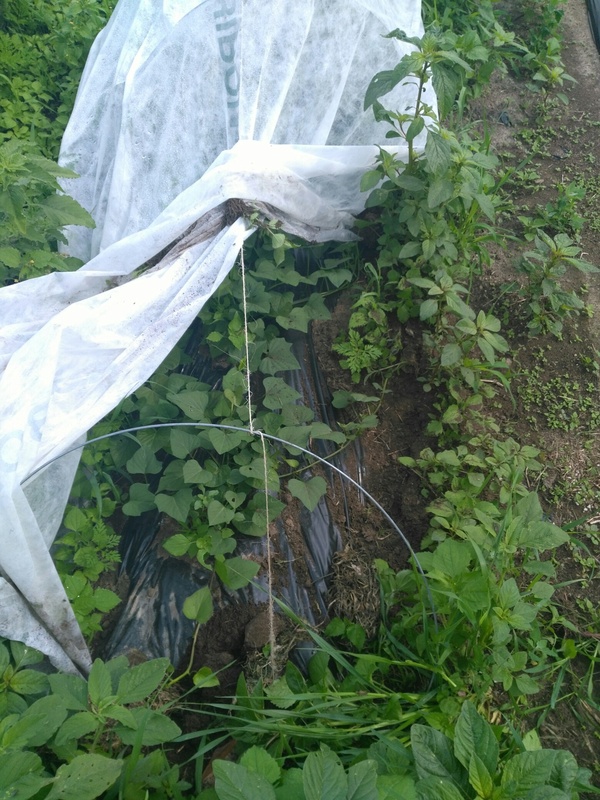 And despite the fact that Ipomoea batatas is very susceptible to cold, you can grow them even in my chilly 45N latitude. 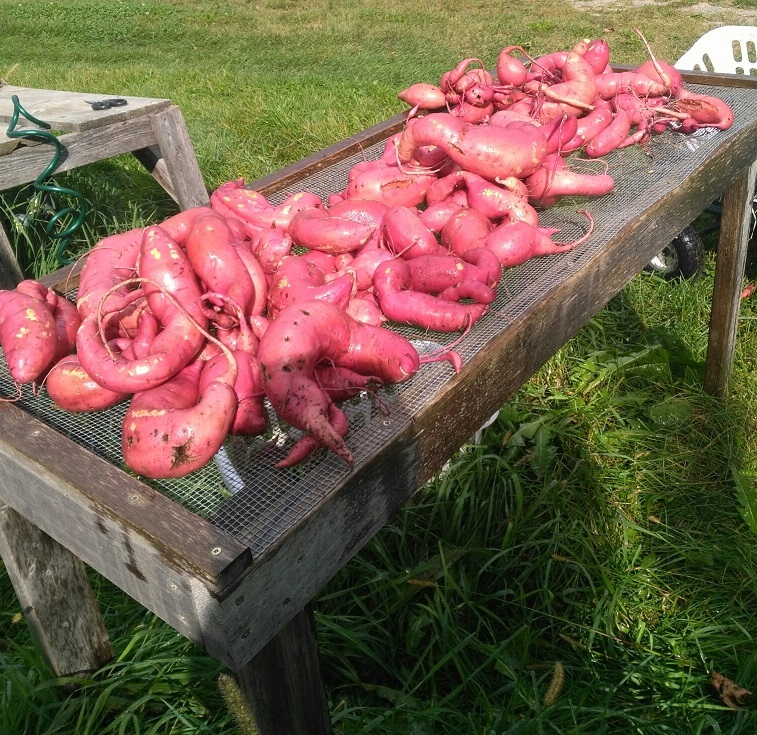 Let’s talk about the why, what, how, and how much of growing sweet potatoes in a cold climate. Why grow sweet potatoes? Some time ago I wrote about planning a survival garden. I mentioned the fact that long-term survival means creating a sustainable food supply, and that means growing your own food. They meet my criteria for yield, nutrition, and storability. In other words, they can provide you a lot of food, in places where the ‘eating season’ extends well beyond the ‘growing season’. I also added another criterion: repeatability. That is, the ability to re-grow the crop from your own seed stock. And if you go about it right, sweet potatoes admirably meet all these criteria. When I first decided to add sweet potatoes to our survival food plan a couple years ago, I checked around with some successful growers in my area. The variety most often recommended was ‘Georgia Jet’. It has the reputation for high yields, cold tolerance (relative to other varieties), and producing well even in a short growing season; about 90 days to maturity from transplant. Georgia Jet is available from a number of commercial seed sources; I got my first slips from one the aforementioned successful growers. My experience bears out the desirable characteristics of this variety. With slips in hand, and past your last frost date, you need to prepare a seed bed. What we’ve learned from experience is that, while the soil does not need to be especially rich, it should be deep and loose for best yields. The best way to achieve this is to mound up the row i.e. make a deep bed. Location:We plant in a spot that gets full sun, in a location that received a generous dosing of composted manure the year before. Sweet potatoes have the reputation of tolerating wet soils. the roots won’t die, even if flooded for extended periods, but growth stops for the duration. A raised bed should let you grow them even in soggy areas of your garden. Planting. Plant the slips 16-18 inches apart through a slit or hole the plastic mulch. Plant up to half the length of the slip, horizontally 3 or 4 inches deep. Water them in well with a dilute solution of fish emulsion. 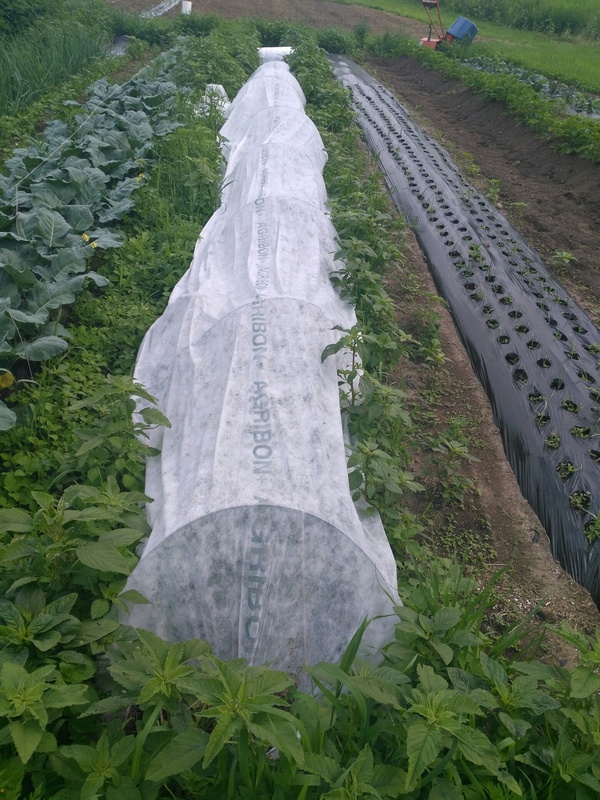 Then - IMPORTANT - cover them with row cover, to provide wind and chill protection. About 90 days later, harvest, cure and enjoy! Yes, I know that row needs some weeding ;-) It was a wet and weedy season in my part of the Great White North. But the plastic mulch helped keep the weeds out and the heat in, so I got some great spuds anyway. The books say you can expect a yield of 3 to 5 pounds per plant. Following the method outlined here, Year One we put 30 plants in a 50-ft row and got 100 pounds of tubers. This year, 20 plants yielded 80 pounds. So that seems like a good estimate. This may be the most critical part of the whole process, from a survival food perspective. Sweet potatoes are very susceptible to chill injury, and must be cured at high temperatures (90 degrees) for 5 to 7 days, and then stored above 55-degrees for long-term viability. This also means you need to get them out of the field before soil temperatures drop below 55. Chilled sweet potatoes won’t store, and won’t sprout. Keep them (much like winter squash) in a cool (60-65 degree) bedroom or storage closet until ready to eat and sprout. I dug my sweet potatoes, gave them a warm rinse, and let them dry in the sun for a few hours. Then I moved them to my plant starting room, and cranked the heat to 90. Left them in there for 6 days, then brought them into a spare bedroom for storage. Put about an inch of moist potting soil or promix in a flat. Place tubers side by side, as many as can fit in the flat. Once sprouts appear, move the flat to the sunniest warm location you have, or under grow lights. Sprout production takes 3 to 6 weeks; judge your timing accordingly for spring planting. When ready to plant, pull the base of the sprout free from the tuber, and plant as detailed above. I’ll let you know how my re-growing works, stay tuned for an update.